The RAF Museum run several programmes of community outreach and engagement, with a variety of sessions for learners young and old. Outreach sessions are managed and delivered by the Heritage Outreach team, subject to availability. The Historic Hendon Outreach Programme is free in Barnet, with talks, crafts and handling sessions. We are able to deliver both at community events and to community groups. For more information or to book, please contact Rhiannon Watkinson, Heritage Outreach Officer. Handling Sessions allow people of all ages to see, touch, smell, hear, and even try on fantastic objects that tell the story of RAF Hendon. 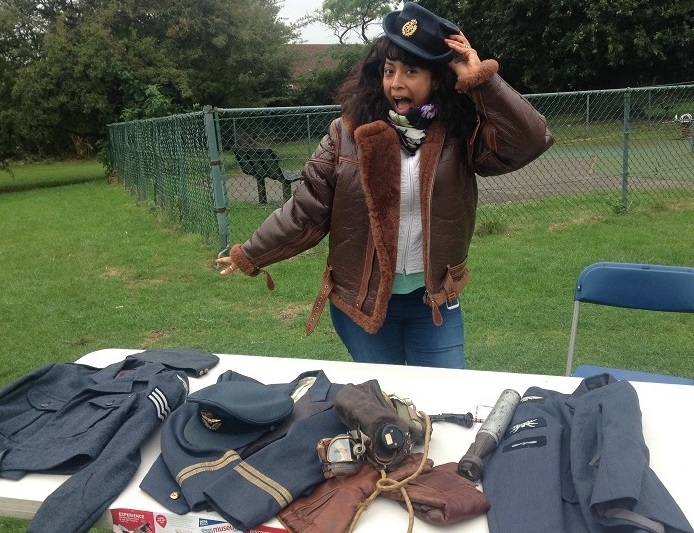 Our vast handling collection bring history to life, and includes World War Two service dress, and Irving Jacket, Helmet and Mae West as worn by World War Two Pilots, and even a replica German incendiary device. Handling sessions are free in Barnet, last around 45 minutes and are suitable for all ages. To arrange a session please contact Rhiannon Watkinson, Heritage Outreach Officer. We offer a programme of talks on the history of Hendon, and on the inspirational stories of servicemen and women from all over the world that make up the RAF. Talks last around 30-45 minutes. Community History Talks are free in Barnet. 'Historic Hendon' - The RAF in Hendon and the aviation history embedded into the area, including comparison photos of areas then and now. To book or request a talk please contact Rhiannon Watkinson, Heritage Outreach Officer. Clothes Peg Planes - Make your own miniature biplanes! Loopy Paper Planes - They look stranger and fly better than other paper aeroplanes due to a bigger surface area on the wings! We also offer Craft Outreach as a single session for a group, which will last around 1 hour and include one or two of the above activities dependent on time.